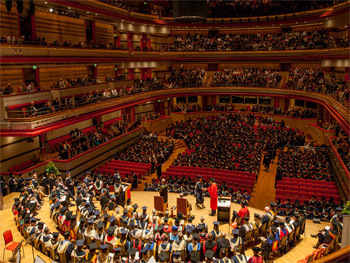 The next graduation ceremonies take place from Monday 22 - Friday 26 July 2019 at our city’s impressive concert venue, Symphony Hall. These ceremonies will be open to students who are due to gain an award by 8 July 2019, 12 noon. Invitations will be emailed to BCU email accounts in late spring. Any student who completes their course, i.e. receives their final mark awarded by an examination board after 8 July 2019 will be invited to the Winter 2020 ceremony series due to take place Tuesday 7 - Wednesday 8 January 2020.